An unaltered photocopy of your DD-214 displaying your Deterrent Patrol Insignia authorization. 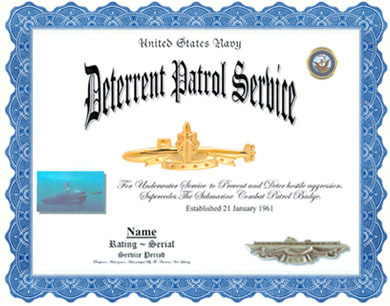 If your DD-214 does not display Deterrent Patrol Insignia status you must provide a copy of your DD-214 and a copy of military-issued orders or other documentation authorizing your Deterrent Patrol Insignia status. 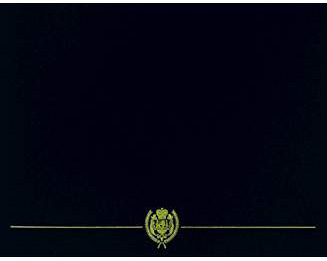 (1) Silver pin alone, without stars, one patrol. (2) Add a gold star for each additional patrol (maximum four gold stars). (3) Patrol pin with silver star, six patrols. (4) Add a gold star for each additional patrol (maximum four stars). (5) in with two silver stars, eleven patrols. (6) Add a gold star for each additional patrol (maximum four gold stars. (7) Pin with three silver stars, sixteen patrols. (8) Add a gold star for each additional patrol (maximum three gold stars). (9) Gold patrol pin, 20 pa-trols. (10) Repeat sequence adding gold stars for each additional patrol (maximum four gold stars) and a silver star for each additional five patrols.